Radiographic testing is one of the longest-used and most sophisticated non-destructive testing methods. It is also most used for its worthiness thanks to the permanent image of internal defects of materials it produces. 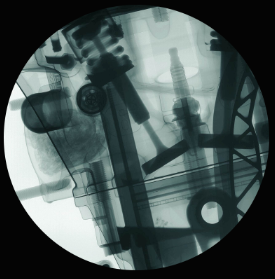 Radiography is used wherever ultrasonic testing cannot be used and where images of controlled material need to be displayed and documented. The method is used to detect surface and internal defects of material – various types of pores, cavities, inclusions, as well as various changes in thickness of material, corrosion of material, etc. The physical principle behind the method lies in the patency of the ionizing radiation by the mass of the checked material and in the subsequent visualization of the radiation behind the material by means of a suitable detector. This radiation is attenuated at the site of the fault. Defects are then shown as more exposed on the film – darker with bigger blacks. Subsequent illumination of the developed film by a negatoscope can be recognized and evaluated. Radiographic testing uses X-rays, gamma, or neutron radiation. Protection against irradiation consists in minimizing the absorbed dose according to the statutory regulations.